The shadows enhance the film's dark tones. 1. 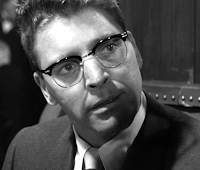 Sweet Smell of Success (1957) - Surprisingly, Burt Lancaster didn't garner rave reviews nor earn any awards for what I consider his finest performance. In this first-rate adaptation of Clifford Odets' play, he stars as J.J. Hunsecker, an influential, immoral newspaper columnist who enjoys the power he holds over people. It would have been easy to portray Hunsecker as a two-dimensional villain. But Burt digs deep into this unlikable egotist and finds reasons for his actions. They may not be good reasons, but he makes Hunsecker one of the most memorable characters of the 1950s cinema. 2. Seven Days in May (1964) - John Frankenheimer's potent political thriller features Lancaster as as General James Mattoon Scott, a strong, charismatic leader who is convinced that a nuclear threat is the only way to hold the Soviet Union in check. The role is a tough one that requires the actor to convince us that Scott believes his actions are driven by patriotism--not his own out-sized ego. The beauty of Lancaster's performance is that he finds that "sweet spot." Like Kirk Douglas, who plays a Scott admirer, we cannot condone the General's treasonous actions. Yet, at the same time, we recognize that Scott is a far more engaged leader than the President prior to the attempted coup. Deborah Kerr and Burt Lancaster. 3. From Here to Eternity (1953) - This classic is an obvious choice, but it's also a mandatory one. Lancaster is sensational as a disciplined sergeant who falls for his commanding officer's neglected wife (Deborah Kerr). Their scene on the beach is justly famous, but its impact can be largely attributed to the build-up conveyed convincingly by two exceptional performers in their prime. As with other Lancaster movies, his fellow cast members may have won the acting awards, but Burt anchored the film with his raw intensity. 4. The Rainmaker (1956) - I expect to receive some flack for selecting this one over more celebrated performances in Separate Tables and Elmer Gantry. Personally, I think that Lancaster overplays those roles (which were perhaps overwritten to start with). He may be loud and obnoxious as traveling con man Bill Starbuck...but he creates magic with Katharine Hepburn. She was Oscar nominated and it's a fine performance, but I think Kate's success as spinster Lizzie Curry would be diminished if she was acting opposite anyone but Burt as Starbuck. It's a role that fits him like a glove. Burt and Ava had chemistry! 5. 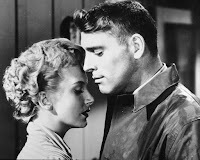 The Killers (1946) - I was tempted to go out on a limb and place The Kentuckian here, since it provides Burt with one of his most different roles (e.g., a likable, honest--but not very bright--pioneer father). However, in the end, I opted for the role that made him a star: The Swede in Robert Siodmak's classic film noir The Killers. One of my favorite scenes is when The Swede meets Kitty (Ava Gardner) and becomes instantly transfixed--it's like there's no one else in the world for the ex-fighter. Burt Lancaster's ferocity dominated many of his later films, but his performance in The Killers proves that he could flourish in an excellent ensemble cast. Honorable mentions: The Kentuckian, Birdman of Alcatraz, The Crimson Pirate, Brute Force, The Swimmer, and Run Silent, Run Deep. Your arguments are very convincing as you turned me into a Starbuck rooter (I only wish he sang like Robert Horton). Pleased to see "Run Silent, Run Deep" on the honorable mention list. It is such an ensemble piece and Burt knows how to blend, yet draw focus when necessary. I understand your pick of The Rainmaker over Elmer Gantry, although I would have put Elmer in there somewhere. I loved the Rainmaker, and have always remembered fondly the very end, when Starbuck turned around and came back, yelling "Gimme my hundred bucks!" Very nice list. Of the films on the list I would have to say Seven Days in May was his best role. The Rainmaker is another great one. I think his funniest role was as Happer in Local Hero (1983). So many great performances. I second in no particular order; Seven Days in May. The Rainmaker, Elmer Gantry, and Sweet Smell of Success, but I loved him in three different Westerns.......Gunfight At O.K. Corral, The Professionals, and The Scalphunters,,,,,great actor not afraid to take chances. I love THE PROFESSIONALS and am always surprised that more people haven't seen it. It would be hard to fault any of these selections. I find his small but pivotal role in Judgment at Nuremburg very compelling and I love The Train but it may not be his best performance. I would also like to mention a "performance" he gave on the Phil Donahue show. He was on to promote Tough Guys and answered questions and talked about unions, his mother, Ava Gardner, etc. I had it on tape for years and wish I still did. Wonderful list. Too bad it couldn't have been 10! I'd certainly include your top 3, but I'd replace the last 2 with "The Crimson Pirate" and "Atlantic City." I also really like him in "Criss Cross." He's great in "The Leopard" but Visconti is the real star of that movie. I don't miss "Elmer Gantry" at all. Always found that performance too unrestrained. Excellent. I can't quarrel with any of your selections but I would argue that more attention should be paid to his career toward the end. Films such as Atlantic City Field of Dreams and Local Hero show that he was a great actor even toward the end of his life. Great point. Several folks have mentioned ATLANTIC CITY. I need to watch it again...it's been a few years. Good choices. I would add Go Tell The Spartans, a little known film about the Vietnam, war. Local Hero and Altlantic City also both reflect him at his best. In Elmer Gantry and a lot of others films Burt has a tendency to overact. My favorite among your well-chosen five is Seven Days in May. And would also add Atlantic City and Local Hero. Not that it would make this list, but I've always enjoyed watching Lancaster and Kirk Douglas play their roles in "The Devil's Disciple" (1959) with such vigor and humor in such an off-kilter kind of movie. Just different enough than their usual takes. Lancaster up against Laurence Olivier was especially fun. I would add his performance as the nazi Dr. Ernst Janning in Judgment at Nuremberg and the Prince Don Fabrizio Salina in The Leopard. To me those are his best performance. Atlantic City, Ulzana's Raid, Criss Cross, Birdman of Alcatraz, The Leopard, his role in Bertolucci's 1900 & I am a big fan of The Crimson Pirate, which is such a fun role.